High quality and made in the U.S.A., this solid turntable runs off a 120 volt outlet and can hold up to 50 pounds. Platform is 17" in diameter and turns clockwise at 2 RPM. Base is solid black and measures 7 3/4" in diameter. Unit is 4 3/4" high. This turntable features a slip clutch. Available with two additional options: 1 RPM -OR- counterclockwise rotation. Inexpensive and durable, you won't be disappointed with this turntable! Note: As with all turntables, the height, width, and distribution of weight all have an impact on the torque load placed on the motor. 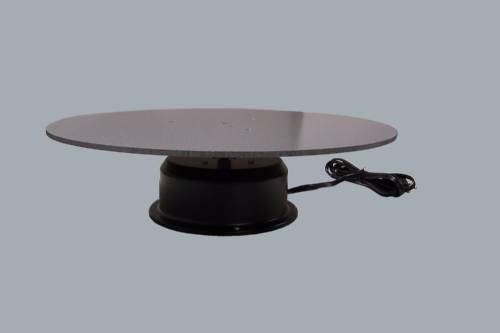 If your display is taller than 12", or wider than the top disk, or if the weight is distributed unevenly, you may need a higher weight capacity turntable.